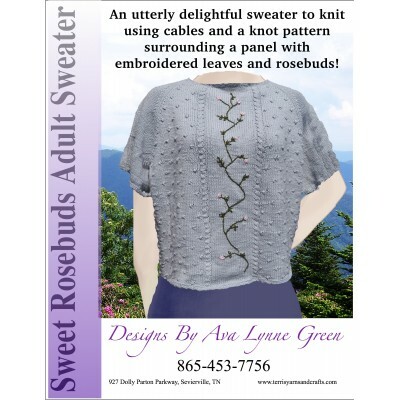 Sweet Rosebuds Adult Sweater is a short raglan sleeved top with a knot pattern resembling rosebuds surrounding a center panel bordered by rope cables. Embroidered vines and rosebuds decorate the center panel while the neckline, bottom and sleeves have a crocheted picot edging. This is the adult version of the child's Sweet Rosebuds Sweater. The sizes are for 32"(36", 40", 44", 48") bust measurements with finished garment measurements of 35.5”(39”, 44”, 49”, 53”). The gauge is 22 sts and 26 rows = 4” in stockinette stitch on size 4 (3.5 mm) needles. In addition to the yarns, stitch markers, stitch holders, a crochet hook, and a yarn needle.